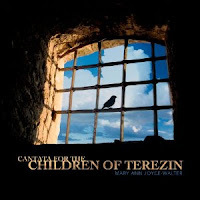 Mary Ann Joyce-Walter has created in Cantata for the Children of Terezin (Ravello 7845) a kind of memorial to the victims of the atrocities committed in the 20th century. The title work "Cantata for the Children of Terezin" pays tribute to the children incarcerated at the Terezin Concentration Camp. The text is based on actual poems the children wrote while imprisoned there. It is a moving work that interweaves Jewish traditional melody and original strains in a kind of post-Britten narrative lyric style. Soprano Oxnaya Oleskaya, the King Singers of Kiev and the Kiev Philharmonic do a great job with the work, which has a melancholy veneer but ultimately is a kind of prayer that these things will never happen again. Similarly the companion work "Aceldaima" is a more general orchestral meditation on the atrocities of last century. Both works are moving and memorable. Mary Ann Joyce-Walter is a composer we will be hearing more of, I hope. When I was more or less a youngster and already under the spell of Bach I found his seminal Well Tempered Clavier on used vinyl as performed by the renowned harpsichordist Wanda Landowska. The recordings were made somewhat early in the fidelity era and her harpsichord sounded a little like a sewing machine. Yet there it all was, the prelude and fugues for every key, taken with all the trills and ornaments, and realized in all its glory. A little later my piano teacher suggested I listen to Glenn Gould's pianoforte version and I duly did. It was an amazing feat, a modern performance with velocity the order of the day, a very different experience but equally exciting. Those two versions have been my mainstays for the work, as they generally have been for many listeners. And over the many years I have ever grown into the music, its genuine genius, the many moods and nuances of the little masterpieces working together. Pianist Andras Schiff, known as a pianist's pianist, has done a new full version of both books which are available as an ECM New Series box (4-cds B0017198-02) and it brings a third major performance of the cycle to the world. 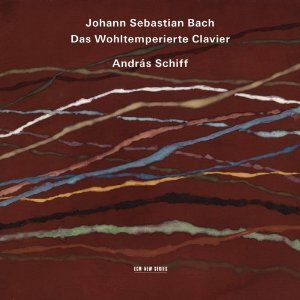 Andras Schiff captures the moods and many nuances of the work with the sensitivity of a master poet. He spells out the lines and counterlines with beauty and clarity. He brings dynamics into the picture as an integrated part of his conception of each prelude and fugue. The velocity is there as Schiff feels the need, but it is not a horse race. It's a brilliant, eminently balanced pianoforte interpretation that brings a consummate pianism to the work that in my experience is unparalleled. Each segment, each prelude and each fugue has a way about it in Schiff's hands that sounds almost inevitable, right, though it takes a performer of extraordinarily abilities to produce such a version. The box set is just out. The ECM sound is outstanding, the interpretation a landmark in Bach for piano, and the music remains the open form of cosmic dimensions, complex yet direct, allowing the performer to put his or her imprint upon it and let the music live on eternally, eternally. There is room for hundreds, thousands of great interpretations and endless aways different experiences of its many incredible moments, by listeners from now until humankind packs it in for all in all. We are fortunate to have this new Andras Schiff performance. I will have the good fortune I hope to re-experience it many times for the rest of my days. Brilliant! 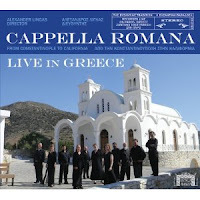 An unusual program of choral music from Byzantine Chant to contemporary Greek composers is on tap on Cappella Romana's Live in Greece (Capella Romana CR409). Director Alexander Lingas takes listeners on a journey that begins with spirited renditions of the austere Byzantine Chant and various gems of Orthodox choral music through the 17th century. The group then performs some Greek Orthodox music from St. Sophia Cathedral, Los Angeles, where original choral music has flourished since Frank Desby founded a choral tradition in the beginnings of the last century. Finally contemporary Greek composer Michael Adamis gets some attention with several of his short sacred works, including the mystical "Radiant Cloud." This is music of endless fascination, performed with impeccable attention to detail. Cappella Romana live up to their reputation as the foremost representatives of the Byzantine choral tradition. Here is a good idea: a series of modern miniatures for various small chamber configurations. 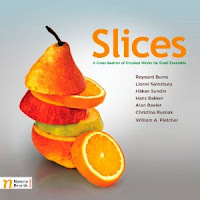 Slices (Navona 5874) covers seven relatively unknown composers of international provenance (Reynard Burns, Lionel Sainsbury, Hakan Sundin, Hans Bakker, Alan Beeler, Christina Rusnak and William A. Fletcher. The music is mostly scherzo-like--lighthearted, not lightweight. I suppose you could say that many have a neo-classical post-Stravinskian feel to them. There's a short piece for solo violin (Sainsbury); a duet for flute and clarinet (Sundin); violin and clarinet (Bakker); then there are four quartets played by various combinations of instruments (two works for piano, viola, clarinet and flute by Beeler, two works by the Moravian Philharmonic Winds: flute, oboe, clarinet and bassoon, by Rusnak and Fletcher, respectively) and a quintet for the Moravian Philharmonic Winds--flute, clarinet, oboe, bassoon and horn--by Burns). The works fit together well, are played well, and have a rather sunny, early morning disposition for the most part. This is a disc that may be easy to miss, but it is singularly appealing. The rethinking of rock-folk art song in more or less classical settings has become a factor in today's music world. There have been such treatments of the music of Robert Wyatt, Renaissance settings of the songs of Nick Drake (see the May 15th posting on this blog) and now...Mercy and Grand: The Music of Tom Waits and Kathleen Brennan (GB Records BCGBCD18) arranged by Gavin Bryars, Joe Townsend and Jim Holmes, performed by the ensemble Opera North. It's a musical conflagration that combines the folk-archaic qualities inherent in the accordion, winds, fiddle-violin and such with contemporary classical and rock touches. In the process the arrangements retain interest and set off the songs well. Mezzo-Soprano Jessica Walker holds forth throughout and her voice is dramatic and powerful. I'll admit it takes some getting used to hearing Tom Waits sung in her way, but once you erase expectations it increasingly works, or at least it has for me. "September is reminding July, it's time to be saying goodbye." 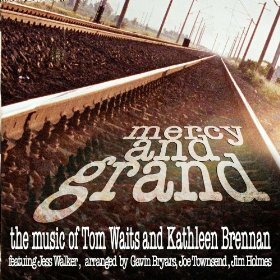 A good selection of Waits-Brennan songs are complemented by a few very compatible songs by Kurt Weill, John Tams, and some old folk songs. The mood can be dark and theater-of-the-absurd-like, socially critical, then comedic, world weary, snide and circus-like in turn, with moments of tenderness and vulnerability emerging from time to time as counter-realities. What matters is that the arrangements and Ms. Walker's voice come together to make a very fresh amalgam that grows on you the more you hear it. I covered Maxwell Davies' Symphony No. 3 several weeks ago on this site. We are back with Maxwell-Davies-conducted versions of his Symphonies Nos. 4 and 5 (Naxos 8.572351), with the Scottish Chamber Orchestra and the Philharmonia Orchestra, respectively. What is true of No. 3 is generally true of 4 and 5 as well. If Boulez's orchestral music is often a sort of hard-edged, rapidly fracturing pointillism, the mature Davies gives us more of a soft-focus, more slowly unraveling variety. Not that Davies is in an all-andante mode, far from it. It is in the general pace, the presentation and combination of instrument families that this comparison applies. No. 4 was written in 1989 and has four movements that do not sound neo-classically derived but break up into sections in similar ways and utilize the classical era orchestra in size and instrumentation. No. 5 comes from 1994 and is in one long movement, scored for a somewhat larger orchestra. If I had to chose, I find No. 3 the more paradigmatic and aesthetically moving work. Symphonies 4 and 5 seem in many ways an extension of the music presented there. On the other hand the later symphonies complete the picture, so you'd probably do well getting both volumes, if you can swing it, especially given the Naxos price. This volume has good sound and the performances are convincing. Where [we] Live (Cantaloupe 21087) is all about home, and it's also all about genre bending. Guitarist-vocalist Grey McMurray joins So Percussion in an adventure that combines song forms, narrative, a bit of post-prog avant rock, new music, world music, post-minimalism and other channels of musical expression in a tightly sequenced program of music that shines forth in ways that stick in the mind. The narrative recalls memories of home--the home of childhood, the homes after youth has flown. The McMurray (well sung) vocals center around personal images and reflected emotions about those homes, memory, and life. Musically there are rather uncanny combinations of percussion ensemble music and rock, with synthesizers/keys and McMurray's forward leaning guitar work forming an important part of the mix. So Percussion and McMurray collaborate on the music and lyrics. The result is a very new form of extended art song that has people like Mike Mantler, Robert Wyatt, Carla Bley and Jack Bruce as predecessors, but goes in a collectively personal direction that offshots from there. The various combinations and interweavings of percussion, vocals, and guitar-synth ensemble provide the listener with an unforgettably memorable tapestry of music. If you abandon the categorical imperatives of genre and just sit back and listen, you will be rewarded with something most unusual, and most excellent. The contrabass has achieved prominence in jazz and improvisation circles over time. In the new music-classical field music for a contrabass soloist with various groupings is less often encountered, and the number of bonifide contrabass virtuosi somewhat proportionately less. 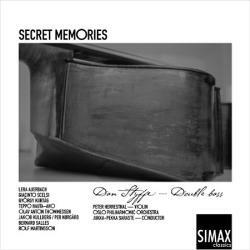 From the evidence of the album Secret Memories (SIMAX 1324), Dan Styffe is most certainly one of the best of them. It features Dan throughout in a wide variety of settings, solo, chamber and a concerto for double bass and orchestra. There are lesser known composers: Rolf Martinsson, for example, contributes the concerto. And some more established ones: Kurtag, Scelsi, Norgard. Drawing it all together is the fine arco and sometimes pizzicato sensibilities of Styffe. He has a beautiful tone and very good technique harnessed to a totalizing musical sensibility. Not all the compositions are of masterpiece quality. Martinsson's Double Bass Concerto No. 1 has a well thought-out solo part, played beautifully, but the orchestral writing veers on occasion to the overly cinematic to my tastes. Nevertheless taken as a whole Secret Memories is one view, a very pleasurable one, of the contrabass as fully fledged solo instrument, in an effective meld of Styffe's very musical approach and some interesting compositions that put him in attractive and sometimes challenging settings. 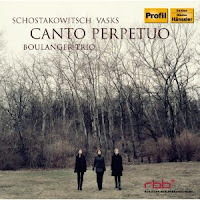 The Boulanger (Piano) Trio show some fabulous interpretive abilities on their Canto Perpetuo (RBB Profil Edition Gunter Hanssler). The consistently interesting Peteris Vasks contributes his "Episode E Canto Perpetuo"; the program also includes Shostakovich's Trios Nos. 1 and 2. It's weighty fare. Vasks' opus from 1985 has, as you might expect, a long and winding melodic quality, but also a bit more modernistic bite than some of his later works. It's a work that pays homage to Olivier Messiaen. It has moments of intense emotion, perhaps in reaction to momentous events in Russia at the time. As one might expect it also has a resonance with Messiaen's work--a widely tonal expression coupled with a kind of tender spirituality. The first Shostakovich Trio is a little gem of his early period (op. 6), with a brashness and a contrasting tenderness that fits well as a transition from the Vasks to the later Shostakovich. The second Shostakovich (op. 67) has a patently Shostakovichian, breathtaking motor pulsation in the allegro movement that's played with relish and fire by the trio. The first movement is more quiescent and mysterious; the third movement majestic and lyrically expressionist. The final movement has that melodic, dancing grotesquery quality that Prokofiev and Shostakovich mastered so well. In the hands of the Boulanger Trio the works are given full, detailed, hard-edged and lyrical readings as called for. The trio seem ideal proponents of the music and breathe sonic life into the music throughout. The sound is quite good. Taking the music, performance and recording quality together as a package, we have a real winner. Bravo! As many readers will affirm Heitor Villa-Lobos (1887-1959), Brazilian master composer, was a 100% original. His guitar music, his vocal music, his piano music, his orchestral works infuse a Brazilian sensibility into a limitless imagination. His orchestral music shows the sure hand of a brilliant orchestrator, a man of many timbres and colors, and a musical mind that conceived on a grand scale with great result, an original whose scores are nearly instantly recognizable as bearing his mark. Today's CD shows all that quite well. It is the Sao Paulo Symphony Orchestra under Isaac Karabtchevsky rendering Villa-Lobos' middle-later-period symphonies: No. 6 "On the Outline of the Mountains of Brazil" (1944), and No. 7 (1945) (Naxos 8.573043). The No. 6 as the title suggest paints a symphonic picture of the beautiful mountainous terrain of his homeland, as a kind of ebb and flow musical transformation of the mountains' peaks and declivities, and does so in vivid terms. No. 7 has a majestic, epic quality as well. Both are superior examples of the Villa-Lobos orchestral style. In the hands of Karabtchevsky and the Sao Paulo organization the works come alive in full flower. The sound is excellent and the performances inspired. As a Villa-Lobos afficianado I treasure this disk, and the works (not previously familiar to me) as performed here. Villa-Lobos in the orchestral zone has a lushness that communicates a grand epic symphonically without falling into Romanticism. Instead he is modern-leaning--but in a very personal, Brazilian manner. These are worthy performances that bring out those qualities well. With the Naxos price tag they are a must for anyone wanting to come to know this music in particular and his music in general. Imogen Holst (1907-1984)? Daughter of Gustav Holst. A composer in her own right. The new Choral Music of Imogen Holst (Harmonia Mundi) gives you a good sampling of her work in that mode. In the hands of the Choir of Clare College, Cambridge, Graham Ross conducting, we get a very sonorous idea of her compositions. The music ranges from the Mass of 1927 to more secular pieces, following her involvement with the choral style through 1972. Throughout she comes through convincingly with the influence of Vaughan Williams (with whom she studied) and the modern English tradition in general (she was Benjamin Britten's assistant from 1954 to 1964) as starting points. There is counterpoint, drama and folk-based music, all given a nice twist in Ms. Holst's hands. 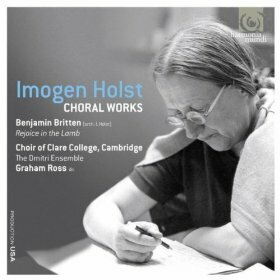 The set concludes with Benjamin Britten's "Rejoice of the Lamb," aka "Festival Cantata," which is a work I am not familiar with but goes well as a bookend to Imogen Holst's work and rounds out the program well. Ms. Holst most certainly qualifies as a discovery. The music is quite beautiful. The Clare College Choir and the Dimitri Ensemble for instrumental parts do the music full justice. And thank you Musical Director Graham Ross for bringing this music to us so vividly. Anglophiles rejoice. The Schubert String Quintet Op. 163 is a work that has long been at the top of my chamber music favorites. It has such a folk-like quality yet it is emblazoned by the melodic-harmonic compositional-developmental hand of the master. Every movement has its own distinctive character mixed with commanding presence, and there is an idyllic, quasi-pastoral character to it, at least to my ears. I never tire of it. 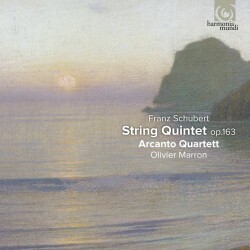 The Arcanto Quartet and additional cellist Olivier Marron have made a rather ravishing recording of the work (Harmonia Mundi) which was released yesterday. I am enthralled with it. Such a crisp, stately, passionate yet musically insightful rendering I have not heard in previous versions. Plus the audio is very natural yet vibrant. All Schubert lovers, you must hear this. I am thankful to have it! Like most listeners it took a little while for me to come to the intimate Bach, the Well-Tempered Clavier, the unaccompanied solo pieces for violin and cello. As time went by I came to treasure these works highly. This is Bach in a "pure" state, unconcerned with audience, writing for himself, the musicians who were to play the music, and the great beyond. His Sonatas and Partitas for Solo Violin are beautiful examples of Bach in this sense. Isabelle Faust presents us with her second volume of the works in a just released CD (Harmonia Mundi). There is grandeur, tenderness, and the thrill of intelligent velocity in Ms. Faust's hands. The phrasings make clear the ornament from the main stem of the lines when applicable. Each piece gets a fresh articulation according to the mood and pull of the music. 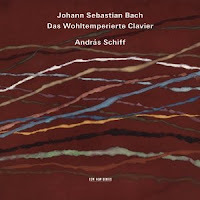 It's beautifully played Bach, perhaps miles from the old Joseph Szigeti recordings I still have on LP from my student days, but quite understandably so. Isabelle Faust is in every way as expressive as Szigeti, but of course she has her own sound, which all-in-all may be better for this music than Szigeti's was. Faust's is a glorious performance, thrilling to hear. There are Monday mornings when I wonder why I do what I do. Such was this one. But then I put Coro Allegro's Awakenings (Navona 5878) on my player as I begin to write up today's reviews and I am reminded forcefully that I do this for the music, the artists, the composers. Coro Allegro is a choral group for members and friends of the gay community and they are very good. The disk features two major works by contemporary composers from Massachusetts (Coro Allegro work out of Boston): Robert Stern's "Shofar, an Oratorio in Four Parts" for soloists, chorus and instrumentalists; and Ronald Perera's "Why I Wake Early: Eight Poems of Mary Oliver for Mixed Chorus, String Quartet and Piano." Both works are well wrought, somewhat eclectic, and performed with vivacious zeal. They show two composers well worth hearing, very comfortable working in the choral genre, soloists of world class ability, and a choral group of superlative skills. Bravo Coro Allegro. Bravo Artistic Director David Hodgkins. This month John Cage would have been 100 years old. There are celebrations of his music going on all over the world and new release are burgeoning in commemoration of the anniversary. One of the more interesting is the release As It Is (ECM New Series B0017198-02) which will be out in the states this September 25th. 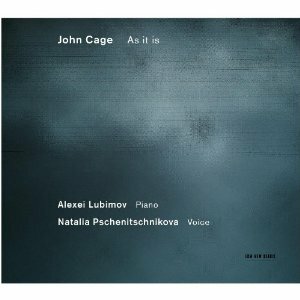 It's Alexei Lubimov on piano and prepared piano, Natalia Pschenitschnikova on vocals for a program of some of the more intimate gems in Cage's oeuvre. The artists have selected judiciously from Cage's body of music to come up with some of the more tonal, quasi-ethnic-folk-like ambient music for voice, prepared piano and piano, alone and in combination. It's Cage at his more directly accessible, much of it early, all of it pioneering. Lubimov, Pschenitschnikova, and producer Manfred Eichner bring out the resonance of these miniatures in ways that stand out. Some have the quirky simplicity of Satie, the prepared piano pieces have a gamelan-like quality often remarked upon but brought to the fore in the ECM production style. Natalia's vocals emphasize the direct simplicity of the vocal lines. Alexei (who championed Cage's music as early as the '60s in his native Russia) brings out the exotic and enchanted qualities of the keyboard parts. This is a great collection of Cage as a model of post-modern sensibility. It is not as concerned with the high modern works of his middle period. As a result it should form a wonderful introduction to Cage for those who have not yet accustomed themselves to the more abstract Cage. It is a very well-performed collection of some of his most directly engaging music. And so it is very much recommended. You can pre-order the CD at Amazon for delivery later in the month. Unaccompanied solo string music is in many ways something normally seen as more for the cognoscenti than the average listener, especially when the music is modern. Now why is that? It's not a music of bells and whistles, by nature, excepting perhaps Paganini's unaccompanied violin works. It can be music of a high level of difficulty for the performer and it shows that performer in a bare spotlight, so to say. There is nothing inherently formidable from a listening standpoint, but the listener must accomodate his or her ears to the solo sound and ambiance. These thoughts occur to me as I listen to Kim Kashkashian's Music for Viola (ECM New Series B0017196-02), a solo viola recital which is due to hit the streets on September 25th. It's two works of a singular focus: Gyorgy Kurtag's "Signs, Games and Messages" and Gyorgy Ligeti's "Sonata for Viola Solo." This is music of a very serious sort. Both composers revel in the unique sound qualities of the instrument, and both seek to make a deeply concentrated series of melodic-harmonic poetics by getting inside the viola's voice as it were. Ligeti's work has a slightly more brilliant palette than Kurtag's. Both pieces work together to provide a kind of fit that contrasts nicely. 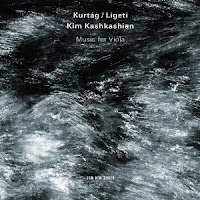 Ligeti's is the more noteful and overtly expressionistic of the two works; Kurtag's the meditatively more profound, perhaps. It's exemplary high modernism of the later sort in both cases. Kim Kashkashian brings out the essence of both works, which depends on alternations of sound and space in a way perfectly well suited for the ECM trademark sound. Every note most certainly counts in both cases and Kim gets a hard-edged yet exploratory tone that seems totally to fit the mood(s) of the music. Attention to detail makes all the difference here and her finely articulated variations in tone, attack and timbre bring out the nuance and subtlety of these works in brilliant ways. It's hard to imagine a better performance. It is not light fare, to be sure. But the more you listen the more you appreciate Kashkashian's performance and the weighty quality of the compositions. Bravo! You can pre-order the CD at Amazon. 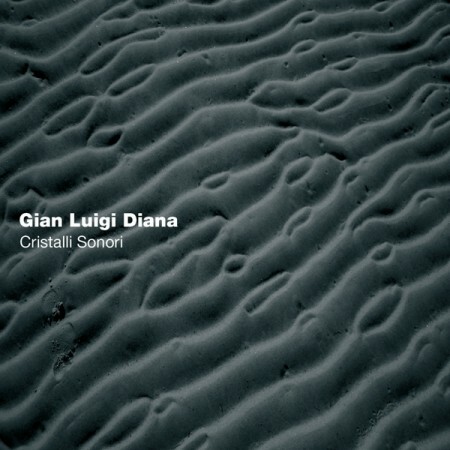 Gian Luigi Diana was an integral member of the electro-acoustic offerings Laghima and Blurboxer that I covered last month.We take another look at his music today with the solo album Cristalli Sonori (Setola Di Maiale SM 1890). As with the previous recordings we have electro-acoustic music devoid of cliche, in the form of the unexpected. 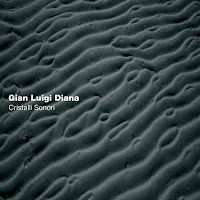 Again, it's in the realm of spontaneous composition and combines Gian's well-thought-through sound universes with real-time acoustic instruments: Patrick Holmes on clarinet, Porra-Boy, flutes and slide guitar, Lisa Dowling, double bass, and Bojan Z. on sax and clarinet, each entering for a segment or two. This is soundscaping without a lot of sustain or drone and more concerned with sonic events that follow one upon another in a kind of narrative flow. The early work of AMM, MEV and Il Gruppo sometimes comes to mind, but as precursors more than as models. It's avant music of a singular cast and will appeal to the patient follower of new sounds. You must let the sequences unfold in time and you will find a rewarding experience in the offing when you do. When Darryl Brenzel decided to arrange Stravinsky's The Rites of Spring for jazz big band, he committed himself to no easy undertaking. The orchestral score of course is complex in itself. How to get it into idiomatic big band form, get solo routine backdrops, get it to swing? 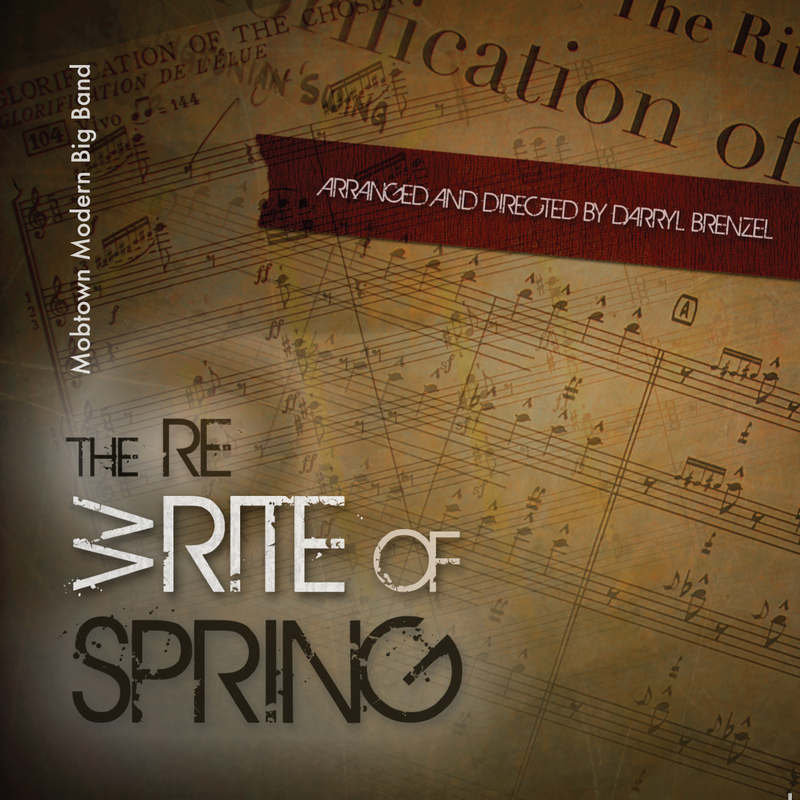 It called for no less than a rewrite of the entire score, and now we have it in our hands as a CD, The Re-(W)Rite of Spring (Innova 824). The Mobtown Modern Big Band realizes the new charts, no small feat, but it comes off well. 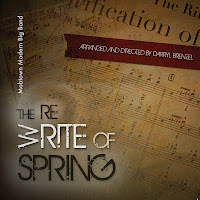 Of course The Rites of Spring is a seminal work of modernism. It has become an icon, a bellwether in the development of rhythmic and multi-melodic complexities in new music. To fiddle with an icon is potentially volatile business. What Darryl Brenzel has wrought may not appeal to everybody, in part due to the above factors. But there is no denying that he has succeeded on his own terms. I find the funk-rock version of the final section a bit unconvincing. How to get it all to rock out and keep the rhythmic dynamic? He does not excatly go that route but rather more or less straightens out the kinks, and I think it's a pity he doesn't leave more of the asymmetry. But that is my own personal quibble and it is overshadowed by the overall impact, which is very strong. So he sometimes simplifies the rhythms to get it all to swing, he adds transitional passages not a part of the original score, he writes idiomatic big band figures as backdrops to soloing routines, all with the idea of getting this into big band stylistic shape. One might quibble with what he does or how he does it. But taken as a whole he succeeds in getting the essence of the work to fly as big band music, and that is quite an accomplishment. The band sounds great. If you meet this music half-way, you'll find much to savor. Brenzel has taken on a Herculean task and made it all work. It is something you should hear whether you come out of the jazz camp, the modern classical camp, or like me, you straddle the fence and appreciate what's good out there irrespective of labels.